"Get this one: my toddler is crying because I gently picked a piece of lint off his back," my girlfriend said, taking her turn on our weekly banter on why our near two year old sons were on the brink of meltdowns. 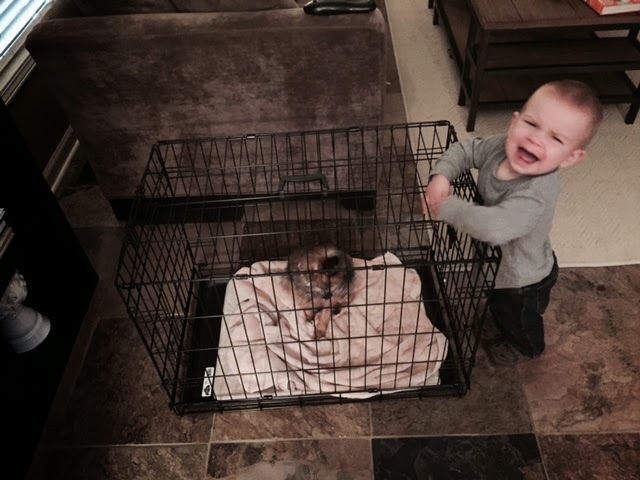 He's crying because he'd also like to lay in the dog kennel. Shame on me for considering that this would be the moment our neighbor or DFS would come by, even though he'd likely be happier doing this than surrounded by toys in his very own playroom. Other events from this week include: irritated he couldn't sleep UNDER his crib, the fact I was trying to apply jeans, that his brother looked at him with a half-smile from 30 feet away and that we were serving applesauce at dinner. Oh - and that I didn't wear the red shoes on his asking. So,what's your toddler frustrated with today?